Jack Skellington and his darling Sally hail from Halloween Town where, of all the ghosts, ghouls, and goblins, these two chose each other. And it’s high time to enjoy the inspiration behind this wedding shoot! This wedding photo shoot was dedicated to the 25th anniversary of Tim Burton’s The Nightmare Before Christmas! 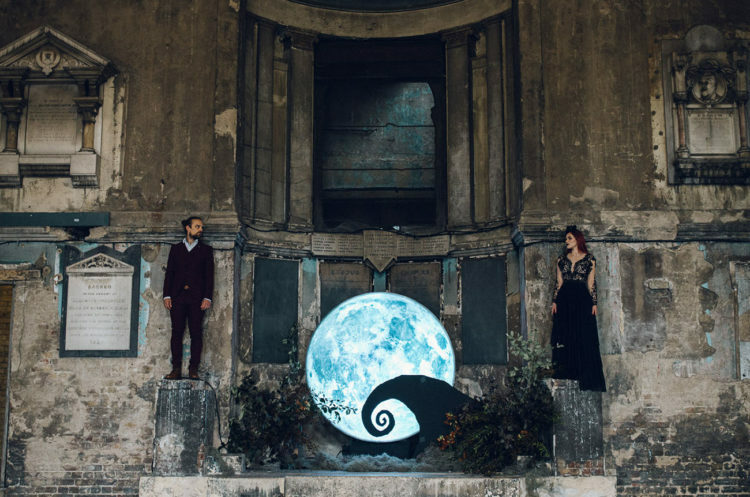 This iteration of Jack and Sally wed at the fantastically spooky Asylum Chapel in East London, with design and planning by Kayleigh Keen and Valentina from The Stars Inside. There was a superbly spooky backdrop, which looks brilliant in the dilapidated hall, and doesn’t it look totally The Nightmare Before Christmas? The tablescape was done with rich burgundy, mustard shades and touches of black, dark glasses and dry twigs. The mismatched chairs are paired perfectly with a sultry red runner. The bride was wearing two dresses, one with a sleeveless bodice, a turtleneck and a plunging neckline plus a layered skirt, and the second was a princess-style black wedding gown with a lace bodice, a layered skirt. She covered up with a black leather hand-painted jacket and rocked an exquisite black headpiece. Sally’s lovely red locks were pinned up by oddities and romantic curls. The groom was wearing a burgundy wool suit from ASOS. The wedding cake was presented with stunning florals in black, with a touch of color. The cake itself was a black hand-painted one and topped with dried blooms. Dive into more pics of this gorgeous shoot! The post Out-Of-This-World Jack Skellington And Sally Wedding Shoot appeared first on Weddingomania.